I read this article and found it very interesting, thought it might be something for you. The article is called Only 1 In 1,000 Indians Lives In Area With Clean Air: New Study https://www.indiaspend.com/only-1-in-1000-indians-lives-in-area-with-clean-air-new-study-53307/. In 2015, only one in 1000 Indians lived in areas where particulate pollution did not exceed the World Health Organization’s (WHO) safe levels for fine, toxic dust particles called PM 2.5, according to a new study. Similarly, the populations in 21 Indian states and six union territories were exposed to PM 2.5 levels above the Indian annual standards–or safe levels–in 2015, said the study, Burden of Disease Attributable to Major Air Pollution Sources in India, led by the Indian Institute of Technology-Bombay (IIT-B), the Health Effects Institute (HEI), an advocacy, and the Institute for Health Metrics and Evaluation (IHME), a research institute. In 2015, the annual population exposure level to PM 2.5–airborne particles 30 times finer than a human hair that can sicken or kill people by entering their lungs–was 74 micrograms per cubic metre (µg/m3). This is more than seven times the WHO’s annual standard of 10 µg/m3 and nearly two times the Indian annual standard of 40 µg/m3. In 2015, one in four deaths from particulate pollution in India was due to household biomass burning, the study said. Combustion of coal in power plants and industries led to 15% of pollution-related deaths. Together, these sources took 437,000 lives in 2015, mostly in rural India. With 2015 as the base year, the three-year-long study tried to understand PM 2.5 exposures from all major sources of air pollution and estimate their health effects by building upon the Global Burden of Diseases (GBD) data. “This systematic analysis of emissions from all sources and their impact on ambient air pollution exposure found significant contributions from regional sources (like residential biomass, agricultural residue burning and industrial coal), underlying that from local sources (like transportation and brick kilns),” said Chandra Venkataraman–a professor of chemical engineering and convener of the climate studies programme at IIT-B–who led the study. In 2015, as many as 1.09 million deaths in India were attributed to PM 2.5 pollution, GBD data show. Even with the most active reductions under an ‘aspirational’ scenario, PM 2.5 exposure is projected to cause 2.5 million deaths in 2050. Residential biomass burning, as we said, caused one in four deaths from PM 2.5 exposure, with a 24% contribution to the total PM 2.5 exposure of 74 µg/m3 in 2015. Coal combustion was the next largest contributor with 7.7% coming from industry and 7.6% from power generation. Anthropogenic dust–that is, dust related to human activities, including fugitive dust from roads and fly-ash from coal burning and waste burning–contributed to about 9% of emissions. Despite the practice being limited to some northern and central Indian states, agricultural burning contributed to more than 5% in nationwide exposure levels of PM 2.5. The study also estimated that windblown mineral dust, mostly from sources outside India, accounted for about 30%–larger than any other source–of total PM 2.5 exposure in 2015. “[A]lthough it was not included in the set of sources related to human activities, windblown dust also arguably results in part from human activities that contribute to desertification, for example, either directly through agricultural or forestry practices or indirectly through impacts on climate,” the study clarified about the windblown natural dust. Measuring PM 2.5 emissions from the natural dust is a “very uncertain” calculation, Venkataraman told IndiaSpend. “If you run two different air-quality models, you will get two different amounts of emissions, because it takes into account the wind speed, assumptions about the soil type, soil moisture and so on. So it is not pertinent to take this number very exactly,” she said. In 2015, about 75% of deaths attributable to PM 2.5 exposure were in rural India, the study found. “This clearly proves that air pollution is a pan-India problem and not specific to urban centres of the country,” said Michael Brauer, co-chair of the working group of GBD MAPS. 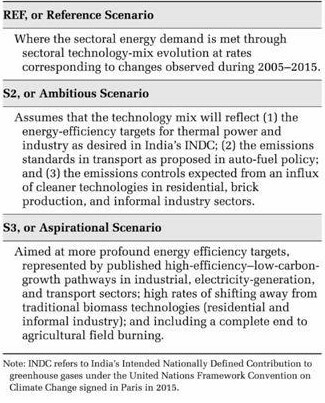 The study evaluated three future scenarios—REF, ambitious scenario (S2) and aspirational scenario (S3)–with differing policies for energy use and pollution control–keeping them in line with sectoral growth rates–to see how the trends related to emissions and their health effects would unfold in 2050. The REF scenario, with the least aggressive control measures, leads to PM 2.5 exposure levels rising to 106.3 µg/m3 in 2050–thereby causing 3.6 million deaths in 2050. Even S2–an ambitious scenario that will require major commitments to emissions reduction in the face of continued economic growth–is projected just to hold PM 2.5 to a 10% increase (to 81.6 µg/m3) by 2050–leading to 3.2 million deaths in 2050. Only under the most active reductions envisioned in the aspirational scenario (S3) are exposure levels projected to be reduced substantially by 2050. The S3 scenario projects the PM 2.5 exposures to reduce to 48.5 µg/m3–a decline of more than 34% from 2015. This scenario will still lead to 2.5 million deaths in 2050. “The burden of disease, in terms of the numbers of deaths attributable to total PM 2.5, is substantial and expected to grow in the future, as the population ages and grows and leaves more people susceptible to air pollution, despite the projected exposure decreases in the both the S2 and S3 scenarios,” according to the study.